I was wondering if any of you would like to share any of your favorite Thanksgiving memories? It has always been my favorite holiday, for a couple of reasons. One is that it is the least commercialized of the major national holidays. Secondly, it is the message it brings...one of thanks and gratefulness for what we have. Whether it is God, your country or your family that you thank, we all owe someone or something for what we have. My father was career military and so we rarely had family for Thanksgiving because we usually lived so far away from any. But what my dad did (along with mom's approval, I'm sure) was this...There wasn't a Thanksgiving that I can remember while my dad was in the military that we didn't have a houseful of young men over--men from his unit. Of course, I thought they were big grown men, and it wasn't until I got older that I realized how young most of them were. It was during the Vietnam war and many of them either had just gotten back, or were going, some wounded physically or otherwise...but the one thing they all had in common was that they were lonely on such a day and away from home with no family or spouse and no where to go for Thanksgiving. I remember how respectful they were of mom and us kids and how much they thanked mom over and over for the home-cooked meal. Those Thanksgivings were my favorites. It wasn't until I was grown that I learned that mom and dad had to take out loans to pay for those big meals, the military paid so well in those days. Today, I'm blessed to have married into a huge, close family. With just the immediate family over at my mother-in-law's house (my wife's siblings, their spouses, kids, kid's spouses and in more and more cases, grandkids) we easily top 50 people now. It's a wonderful, noisy day. Hope that everyone is as blessed as I and has a great day tomorrow. I suspect that one of my best Thanksgivings will be tomorrow. We opened a business this past summer and although it is in a wonderful location, we have road construction right in front of us. When we first rented the building we were told that the work would be done long before now, and it hasn't. And the construction seems to make us less and less accessible. Where we use to be flush with the road, we are almost sinking! Well, this has been our first business, and it has been horrible. Add to that a few other issues, some less than kind people and the possibility of losing everything, including our home. By this past weekend, I realized that we were even running out of food, even though I am such a hoarder, and there was no chance we would have a turkey. Well, one of my friends that has little to nothing offered to give us her last dime to buy us food and a turkey. While so many knew we were going without and turned their backs she was willing to give us it all. I refused. She kept offering. And she meant it. She wasn't just being polite. Well, the past two days, as if by a miracle, we have had business. Lots of business. Enough to pay some bills and buy a huge, wonderful, glorious turkey. The first thing I did was call that wonderful friend that offered everything she had to us. You see, this friend had just lost her husband this month. And she has very little. She had planned on heating up a frozen dinner for Thanksgiving. Instead, she will dine with us and I promise her it will be the best feast she has ever had. And I will be able to be June Cleaver, which always launches me into a state of nirvana! Our daughter will gain a valuable lesson and our house will be filled with love, happiness and perhaps even some hope. Folks, lets be a little kinder to one another. I see a lot of people at church on Sunday but doing little for each other the rest of the week. It's great if you have lots of family, especially if you like them! But let's make sure that a co-worker, a neighbor, isn't left out. For those that have, please share with others. Wow...I'm so touched by both of these stories. Thank you for sharing them. Thanksgiving is definitely my favorite holiday for a number of reasons, but mostly because of what it represents. My favorite thing to do on Thanksgiving is cooking the turkey. I've been cooking it for about 5 years now. I have a 3 1/2 year old and she loves to help cook...so this year she has really enjoyed helping me pick out the bird, start the brining process, and I'm sure tomorrow she will be thrilled to see the big bird in the oven. It is all about family, obviously. I definitely have fond memories of my grandmothers who have passed away and recall their great food and more importantly their great personalities. When we have "Grandma's" sweet potato casserole each year, I always think of her. This Thanksgiving I'm going to a friends house. I'm "company" on a real holiday. In the past it was always spent with my ex's family and that was tedious playing a role of a happy all american family. I've always cooked and invited those that had no one else to come over and join in. This year I am very thankful for the friends I have here in Tn. and I feel blessed. You see I am the friend Hiknapster is talking about, I lost Bill on November 9. I was planning on heating Stouffer's Lasagne for dinner. Now I'm going to June Cleaver's and can't wait. So this year I am thankful for good friends and being blessed to be so rich in friends in Tn. My daughter is home from college, my son is living at home while getting his career underway since graduating from university and we have our family coming over for dinner. Then it's off to my sister's house for dessert. My wife and I will get the bird in the oven by 9 AM. We eat around 3 PM. My son and daughter and I have a 5 year tradition of sitting on the back deck and listening to Alice's Restaurant at noon on 102.9. I am so sorry to hear of your loss of Bill. There is nothing that I can say to lessen your loss. However, I do know that God will give you the strength to move forward in your life's journey. You, Hik and I met on the Tri-City forum several months ago. We were engaged in a heated discussion with GloriaGrace. Remember her? You both were very supportive of my posts. I will never forget that. I have been reading & enjoying many of your's & Hik's posts on the Knoxville & Tennessee threads for about a year now. You Knoxville folks simply rock! A woman from the senior center who is alone, invited people who are also alone over to her house for Thanksgiving dinner, just as she did last year. Last year 8 people showed up and they had a great time. I was not in TN last year, but planned to attend the dinner this year. However, I recently had spinal fusion surgery and am still on the mend and feel that I would be more comfortable at home. So, I will be alone, but looking looking forward to next year. What can I say about close friends other than Priceless! Enjoy! Thank you for such kind words. I will think about you tomorrow. I truly hope you heal soon. Take comfort in knowing that you are a good person and that people like you always triumph in the end. Happy Thanksgiving. I do remember and thank you for your kind words. I hope you mend quickly from your spinal surgery and wish you all the best. Next year I bet you'll have a wonderful and blessed Thanksgiving. How could anyone not living in Tennessee? To me the spirit of Thanksgiving is alive and well here. Well, Hiknapster and Pam, you have given me my holiday blessing this year. You stories are so touching, i'm sitting here in tears. Pam, i'm so very sorry for your loss. Words are just empty, but i'm sending my love and prayers. How wonderful that you have Hiknapster close by and the two of you share a friendship of support and caring! Skinem, thanks for sharing your Thanksgiving story. Thank God for your very special parents and their efforts to provide comfort to those young, lonely men on this holiday. Don and alpha, enjoy making those Thanksgiving memories. In years ahead you will flip back thru those pages in your mind and cherish these days. SCBaker, I'm sorry to hear about your spinal fusion surgery. I've had 4 of those as well and am now fused from T4 - S1. 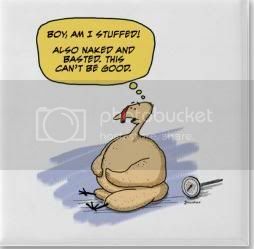 I hope your recovery is smooth and swift, although you are surely not able to do Thanksgiving this year. Hope you enjoy the day and know that you are loved and not alone in spirit!! I have no special stories to tell about Thanksgiving. We grew up with the bare necessities, usually having a baked chicken instead of turkey, but the sweet potatoes and dressing was there. Last year, i enjoyed the day more than ever, just because my children and grandchildren were here and everyone was happy and healthy and laughing together. This year i'll be thinking of you all and adding you to my list of things to be thankful for -- my friends here on the forum. God bless you all!